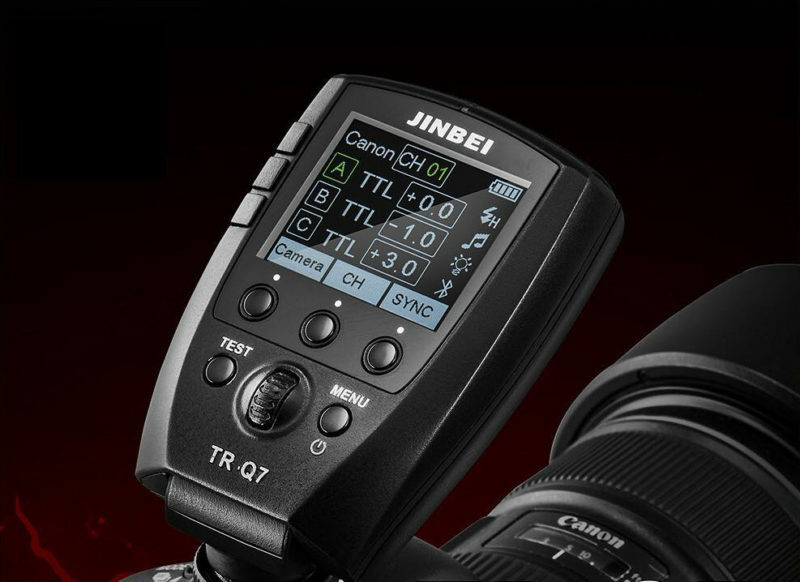 Jinbei has announced an upgraded version of their TR-Q6 flash trigger, called the TR-Q7. The latest model adds a full-colour screen and a built-in lithium battery. The existing TR-Q6 offers TTL and HSS support for Canon, Nikon, Sony and Fujifilm. According to the manufacturer, the new TR-Q7 will offer Canon, Nikon and Fuji TTL/HSS support all in the same unit, letting you choose your camera brand via a menu rather than having to buy different transmitters for different cameras. This has been attempted before, but can be finicky due to interference between the different hotshoe pin layouts. This innovation can’t extend to Sony cameras because the multi-interface shoe is not quite the same Iso standard. It is not clear if a Sony version will come later or if Sony users will have to stick with the TR-Q6 for now. The Jinbei TR-Q7 supports up to six groups: A, B, C, D, E, F, and can display three at a time on its colour screen. Sixteen channels, 00–15 are also available. The unit is designed for controlling multiple lights with TTL and HSS, such as the HD-610 battery monolight (review), Mars-3 pack and head and MSN TTL studio heads. Many of these lights are also available from Adorama in the US under the Orlit brand. Other anticipated features include WiFi app control. Jinbei will be at stand C031 in hall 4.2 at Photokina next week, where we can expect to see the new TR-Q7 transmitter, as well as possibly more information on the Jinbei HD-2 speedlight.